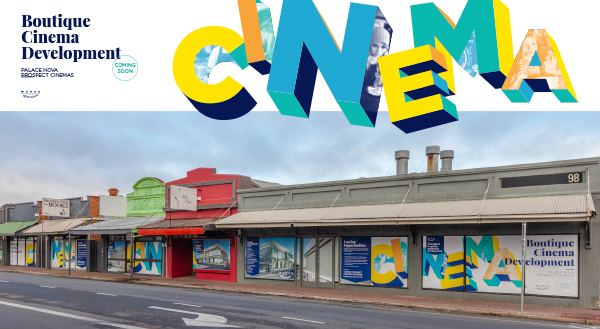 The Maras Group are currently working with Palace Nova to develop a new cinema experience in Prospect and asked us to help create some excitement for the upcoming development using five empty shopfront windows. Our solution was to create window graphics with a colourful, typographic approach to engage viewers and connect the signage from building to building. Below you can see our original concept and then how that translated to the finished project. Overall it is a successful campaign that brings to life the empty shopfronts, check it out on Prospect Road while you can.